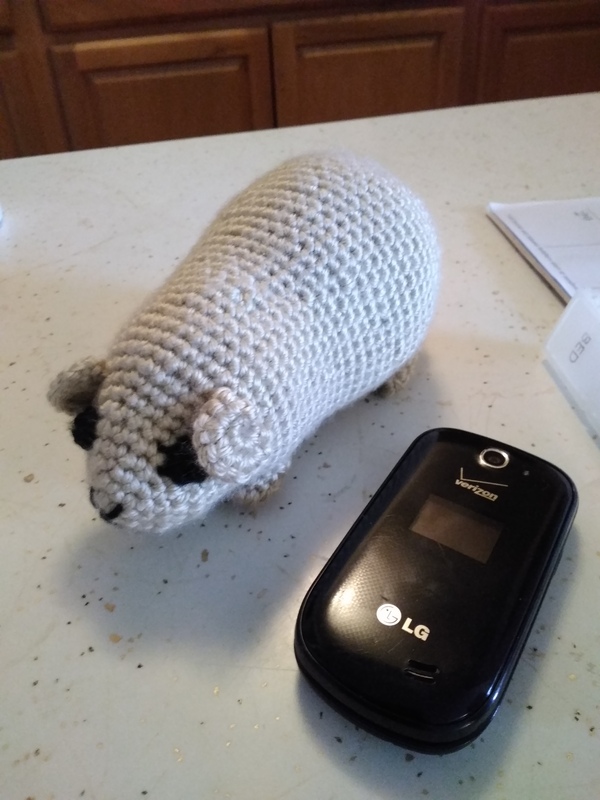 A tiny crocheted guinea pig no bigger than my cell phone (not a smart phone, just a simple cell phone) now lives at my grandson’s house. He is nine. He has so many stuffed animals on his bed that I asked him where he slept. He assured me there was room for him. What does he want for his birthday–next September? Already he has decided. 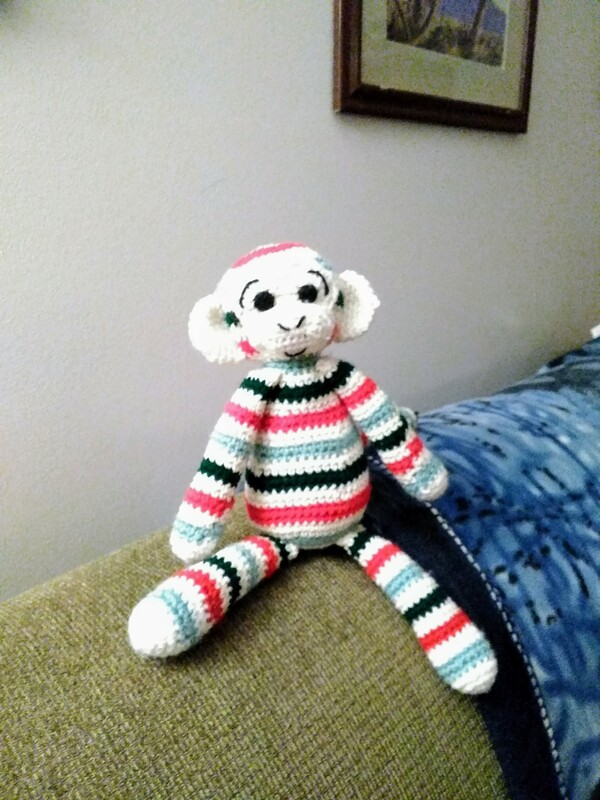 A crocheted monkey. I am meant to cast the shadow of the one who created me. So often I do not. Often, I think the sun shines on me so I can be the one who is the most important. But the true meaning and joy of living comes when I realize that the shadow people see as God’s light shines on me is His shadow–the One who created and loves me, the Jesus whose birth we celebrate! but spend our lives in sin and strife. that life with peace from Him could grow. this Child of Grace, God’s only Son. and He is God who rules all things. for He will end all wickedness. to give to all a bright new morn. Thanksgiving Day is over, but thanksgiving never should be. 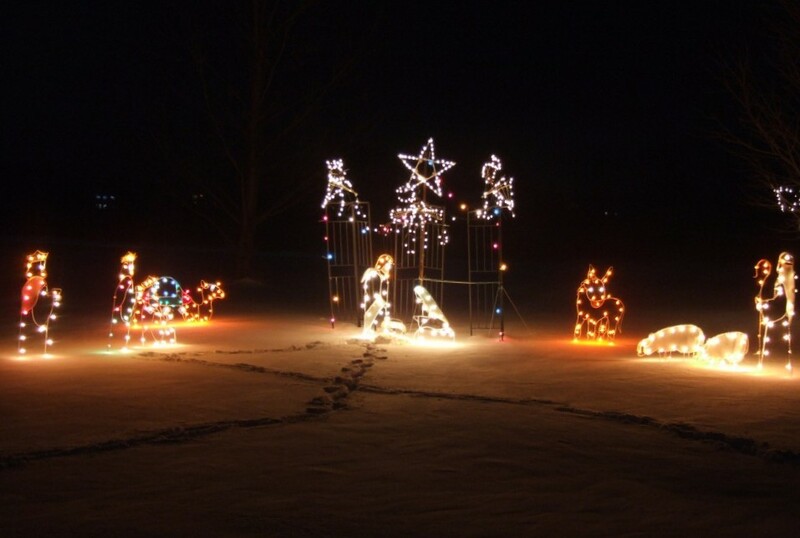 I posted this picture of Christmas in lights to remind us: the most wonderful reason to be thankful is that God Himself came down to earth and took on human form. Because of Jesus coming to earth, suffering, and dying, we have access to God through Him. That is the greatest reason to give thanks that I can ever think of! And so we end a day with the special memory of the Terrorists’ attack on our country on September 11, 2001, It was an event that never fades from the memory of those who lived through that day. As I remember, I pray for God’s grace to protect our country and draw us back to Him. “God Bless America, land that I love. To the oceans white with foam. Today, we in the United States celebrated the 242nd birthday of our great nation. I am so thankful that He has blessed us and I can worship Him freely. What a gift from our Creator! As I view events in many parts of Africa and Asia and watch Christians suffer, losing everything and even their lives for their faith, I pray for them, wondering why it is so for them and we are so blessed. But I realize that God does not ask me to always understand, but to be thankful for His blessings. Good to remember Dad! Wish all dads were there for their children! Thanks to A Momma’s View! My daughter was sharing something that happened with me the other day and one phrase was, “and this little old lady”. I don’t mind growing old. I just pray I will not become a crotchety old person, but one who has learned to roll with life’s punches and still reflect the joy of Jesus.